The Lectionary readings for worship this Sunday include Psalm 130 and Mark 5:21-43. In preparation for our time together, read the gospel text at least twice. With each reading, note what strikes you about the text. About what would you like to know more? Although there are two healing stories told in this Scripture passage, the one on which the sermon will focus is the healing of the woman who has been hemorrhaging for 12 long years. The above image portrays Jesus surrounded by crowds of people and the woman, reaching out to touch his garment, reaching out in desperation and hope. Spend a few moments simply gazing at the painting. What new thoughts cross your mind as you consider this story of healing? Finally, once more read Mark 5:21-43. Our readings for Sunday include 1 Samuel 17:1a, 4-11, 19-23, 32-49 which is the story of young David bringing down the the giant. 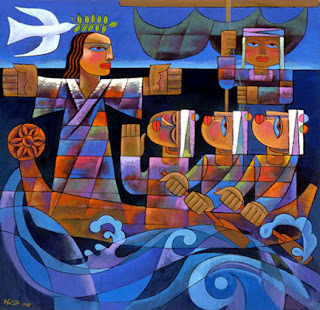 The New Testament reading comes from Mark 4:35-41 which is the story of Jesus calming the storm. Read through both texts at least once and consider how fear is a factor in each of the stories. Once again, read Mark 4:35-41. Now, take a few moments to prayerfully meditate upon the image provided above. What thoughts and feelings do you experience? What is your response to this analysis? Is worry and fear an ongoing challenge in your life? If so, how might the power of God working in the life of David and in the life of Jesus help you to see things differently. I pray you have a worry-free week as you journey toward worship on Sunday. The Lectionary readings we will be using this Sunday include 1 Samuel 15:34-16:13 and Mark 4:26-34. As you prepare for worship, read through both texts in a favorite Bible translation. What task does God give to Samuel? At first, whom does Samuel think will be chosen as the next king of Israel? Why? What does verse 7 tell us about God's way of "seeing"? What method does Jesus use most often to teach? In your opinion, why does he choose this method? In light of the two parables, what is God's kingdom like? After reading this passage carefully, what questions come to mind? Once you have read through the above, choose a phrase or a sentence that really speaks to you. As an offering of prayer, sit down with a paper and pencils, markers, crayons, etc. What you are about to do is a spiritual exercise called "Illuminate the Text." Somewhere on the sheet of paper, write out the phrase or words you have chosen. Using borders, symbols, pictures, and even squiggly lines, illustrate the words. In an example provided by Mary Mohlke in the Presbyterian resource, "Lord, Teach Us to Pray," the chosen words were "Behold, I create a new world..." and the drawing is of the earth. When I participated in this exercise today, from our reading I chose the phrase "Picture God's Kingdom" and I drew a person sleeping on her bed, plants growing while she slept and a wagon full to overflowing of the harvest. Now it's your turn. Try the exercise and be sure to share your results with your pastor. She is eager to hear about your experience of illuminating the text! The Lectionary texts for Sunday include 1 Samuel 8:4-20 and Mark 3:20-35. What do the people ask of Samuel? Whom have the people rejected? What warning does God send? Let us now turn our attention to the Gospel of Mark. With pencil and paper handy, use the practice of lectio divina (sacred reading) to ponder the text carefully. Slowly read verses 20-35 and silently meditate upon what you have just read. You may wish to simply sit quietly with your eyes closed for a moment. Now, write down what words, phrases or thoughts came to mind. Read through the text a second time and, again, jot down your thoughts. Finally, put yourself in the story, perhaps as one of the newly named disciples or one of Jesus' family members. Choose anyone you wish. Then, try to read the text seeing your surroundings and hearing what is happening through his or her eyes. Following this reading, what strikes you as new or interesting? Jot that down. As you likely know, each week I meet with a group of pastors to consider the upcoming Scripture readings. We always end our time together with a spiritual practice of some sort. This week, one pastor in our group led us through an exercise that was so much fun, I want you to have a chance to experience it as well. Looking back over your notes from your time of meditating on Mark 3:20-35, choose one word that really speaks to you. Now, write that word vertically on a piece of paper. Then, create an acrostic of the word, using the first letter to make another word of phrase--preferably something that comes to mind as you consider what is happening here with Jesus, his disciples and his family. Just for fun, I am including the acrostic that came from my experience of this exercise. I chose the word "house." It is a word that occurs a couple of times in the reading. Now it is your turn. Choose a word and develop your own acrostic. I look forward to hearing about your experience AND seeing you in worship on Sunday.